Hyderabad: As many as 18,000 policemen were deployed for Ganesh Chaturthi and subsequent immersion after ten days in Hyderabad, police said Thursday. According to city police commissioner Anjani Kumar, the police have received about 12,500 requests from various organisations and individuals for erecting Ganesh idols across the city. "We have deployed 15,000 policemen for the security supervision during Ganesh Chaviti. Our officers will ensure that every pandal has security personnel. We seek cooperation from the Ganesh pandal organisers also," Kumar told PTI. "We asked for two companies of central forces (RAF and CRPF) for the purpose. We have drawn about 3,000 policemen from other districts as well," he said. 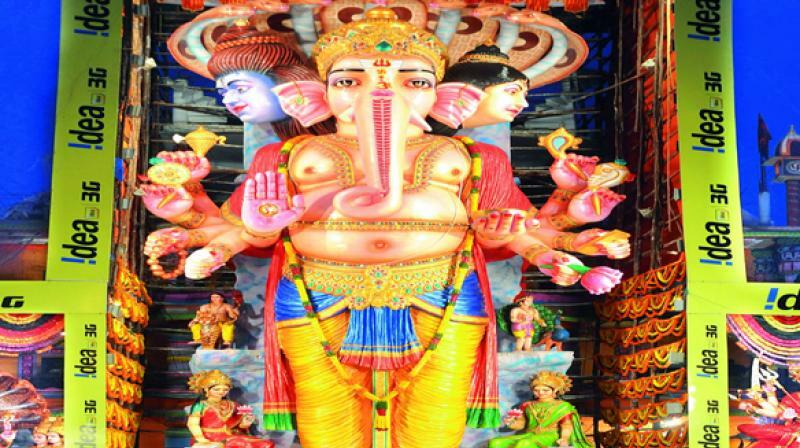 Bhagyanagar Ganesh Utsav Samithi chief Bhagwantha Rao said this year the Ganesh idol set up at Khairatabad is 57 ft tall and it is the tallest of all in the state. Rao said the 11-day festivities will end on September 23 and all the idols will proceed for immersion. Meanwhile, political parties performed Ganesh puja at their respective offices. Governor of Telangana and Andhra Pradesh ESL Narasimhan and Chief Minister K Chandrasekhar Rao greeted people on the eve of the festival. "The Lord Ganesh may lead all the people of Telangana on the path of progress, happiness, peace and prosperity," KCR said in a statement.